Home Security Systems - Alert 360- Home Security up to 25% off RETAIL! Home Security System packages starting at $15.95! Start Securing Your Home Today! Fill out the form and an Alert 360 Security Specialist will call you about special offers. Home Security Systems & Alarm Monitoring! Protect your house and loved ones with state-of-the-art security systems that are easily controlled using our mobile app via smartphone, tablet or desktop. We offer a wide selection of security video camera. See what’s happening at home or business with your smartphone, tablet or desktop and ensure loved ones are safe no matter where you are. Add comfort, convenience and better security to your home when you control lights, locks, garage door, thermostat and more using our automation services and devices. Cut high utility costs, better your home’s overall energy use and make appliances run much more efficiently. Save up to 15% or more on your electrical bill with a thermostat! Lighting that only uses 6 watt! Streamlined home security + automation with Alert 360. Stay connected, secure, and in control with Alert 360’s complete home security systems and alarm monitoring. Our home automation products and home security services will make your life easier and more secure! Connect and operate your security with Google home & Alexa. With our business security solutions, it’s easy to stay connected to your business and protect employees, assets, and inventory! Security cameras, access control and MORE! Home security by just a touch! With the Alert 360 app, you can arm and disarm your system from the convenience of your phone, tablet or desktop! No landline needed! Trusted by hundreds of thousands of customers. Call and find out why! Customize your smart home thermostat to fit your lifestyle. 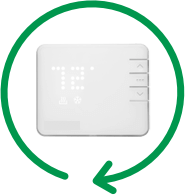 Our app allows you to automate, control and monitor your home’s temperature all from the the palm of your hand. Save energy and money! Whether it’s friends or family, a cleaning crew, contractors, there are a lot of reasons you might let people into your home when you’re not there. 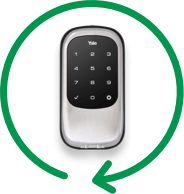 Alert 360’s smart locks and app let you see, communicate with and grant access to visitors all from your phone. Never worry about lost keys again! 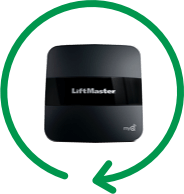 Smart control with the Alert 360 app, you can control your garage door from anywhere. Whether you’re unsure if the door was left open or need to grant access to visitors, Alert 360 gives you complete control. Upgrade your Home security! Staying connected to your home just got easier. 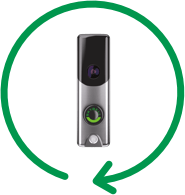 With the Alert 360 app and video doorbell camera, you can see and speak to visitors at your front door from your phone. Know who’s there? Unlock the door right from the app to let visitors in. Founded in 1973 in Tulsa, Oklahoma, Alert 360 evolved from Guardian Security Systems and Central Security Group. Alert 360 is one of the nation’s oldest licensed alarm monitoring providers. Today, Alert 360 is the fifth-largest provider of monitored home security and automation solutions to homes and business alarm systems in the United States. Alert 360 operates a monitoring and customer service center in Tulsa, Oklahoma, and a second large customer service center in the Dallas suburb of Irving, Texas. We have offices in 17 cities and over 200 Authorized Dealers across the nation. Alert 360 is CSAA Five Diamond-Certified Alarm Monitoring Center. We were named as an Inc. 5000 “Fastest-Growing Privately Held Company in America” in 2016. Alert 360 has also been named a “Best Places to Work in Oklahoma” for 2016, 2017 and 2018. Same Great Company, Brand New Name! Our new name, Alert 360, reflects the latest home and business security and automation technologies we offer today – and in the future! Thanks to our loyal, satisfied customers, we’re proud of our strong history of service excellence. And, if you have read this far, we would love to tell you why we’re not just another security company! Or, click the learn more button below and read about who we are and our journey! Alert 360 has over 45 years of experience and an A+ rating from the Better Business Bureau. Our dedicated team of experts provides home security systems consultation and installation, video security cameras either streaming or 24/7 recorded video, smart home automation services, superior customer service with 5 Diamond alarm monitoring for homes and businesses nationwide. Thanks to our satisfied customers and committed team, we are one of the fastest growing home security and automation providers in the United States. We are devoted to our mission of bringing state-of-the-art security and automation equipment to both home and business owners. Our number one goal is the protection of you, your loved ones and property! Whether you are looking for a small or large home security system or a business security alarm system, our highly trained security consultants and installers will work with you to design a perfect custom security or automation system that works for your family or business. 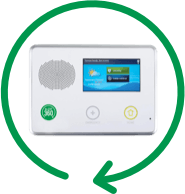 Alert 360 customers who provide a referral that results in the installation or activation of a monitored residential or home security system, the referring customer can earn up to $150 credit to their Alert 360 account for each referral! It’s simple, just click the button below, fill out the form and save some money! "My technician was phenomenal and very personable. I’m very pleased with my home security system. I actually made an appointment for camera installation during my service call!" "Installer showed up on time, and was courteous. He answered all my questions about the burglar alarm. We showed me how to work our home security system through their app as well as the website. Everything is working great. They are the best!" "Very prompt and professional. Great home security video cameras! Would highly recommend their home security services." "BEST Home Security System Installation AND SERVICE EXPERIENCE EVER!! Very knowledgeable and polite technican. Arrived on time. Quickly trouble shooted the alarm system issue and resolved." "As always... on time, service was GREAT They have the best smart home automation! There are none better than ALERT 360 and I have tried most if not all of them. Thanks. Carroll"
"This was best experience I have ever had with any burglar alarm company. I have had an alarm system for many years. Great front door video camera!" Alert 360 sent a tech on Saturday to help me with my home security cameras. Thanks so much! Your the best home security company! "Very efficient set up. The tech, Brandon, suggested adding smoke detectors. Kelsi got to work and in our case, the insurance discount covered it! Added piece of mind at no cost. Whole process was very easy. They gave us notice when they would be coming to install front door camera and outside video cameras - answered all my questions." "I have always had great efficient service and knowledgeable technicians . Been a customer 15 years- highly recommend! Best home alarm company!" "The technician from 360 Alert took his time in explaining our new home security systems. He showed me how-to play back the video camera and front door camera on the television and on my phone. Best surveillance cameras." "Guy's team was excellent to work with, on time, friendly, professional, honest, answered all our questions. Love our home automation: smart thermostat, lights and front doorbell video camera. Thanks for all your hard work!! I will definitely recommend them to everyone." "Great home security system! You have the best home alarm system on the market and I will refer friends and family! You guys are awesome!" "Here's my review. I have used the Alert 360 home security system for a little over a year (switched from another service provider). Equipment, price, and overall experience with customer service are exceptional. I highly recommend!!!" "Best security service a customer can ask for. Love my video cameras. I would definitely recommend to anyone searching for a security service!" "Alert 360 security is the best security company -I've been a customer since 2009, they are fast, friendly, patient, reliable and I would give them 10 stars if I could!" "Awesome security service. Would definitely recommend to friends and family!" "Always professional! Easy appointment scheduling. Love my wireless cameras." "I am very excited about my video doorbell and backyard cameras. Excellent service!"